The Friends of Hayes Park is an organization of dedicated neighborhood volunteers who take care of all planting and maintenance, and host regular community events in the park. Organized in 1987 to advocate for the redesign of the park, the Friends of Hayes Park is a 501(c)(3) tax-exempt organization. Since the completion of the park in 1992, the Friends have worked as a “Park Partner” with the Boston Parks Department. The Friends raise the funds required to maintain the park and foster community via membership, sponsorship and donation solicitation. Funds raised go towards garden maintenance, replacement of trees and shrubs as required, landscaping and cleanup. Members of the Friends of Hayes Park volunteer their time to tend roses, tame the ground cover, rake stone dust, pull weeds, and plant the flowers in the center bed, including the 1000 tulip bulbs that erupt in a riot of color each spring. The Friends group also hosts free community events – including the annual May Day celebration, Summer Picnic, Harvest Fest and Holiday Caroling – and contributes to the community in other ways, such as collecting canned goods for the local food pantry and sponsoring South End Soccer and the Hayes Park Yankees, one of the South End Little League Baseball teams. We invite you to enjoy this oasis in the city, and become one of the Friends of Hayes Park! Hayes Park is located on the site of the Warren Avenue Baptist Church, a red brick Gothic building completed in 1866 at a cost of $105,000. In 1920, when the congregation rejoined the First Baptist Church on Commonwealth Avenue – which it had left in 1742 – the Warren Avenue building became the home of a Seventh Day Adventist Church. In 1942, the building was renovated and re-dedicated as Our Lady of the Annunciation, a Catholic Melkite church, which served the large Syrian and Lebanese population in the South End at that time. The church held services there until the parish moved to West Roxbury in 1966. The following year, a fire destroyed much of the abandoned building, and it was razed in 1968. Shortly thereafter, neighbors from the community successfully advocated for the creation of a public park on the vacant site, and in 1970 the new park was named for James Hayes, the revered head of a local South End family, many of whom still live in the neighborhood. The church was not forgotten, however. 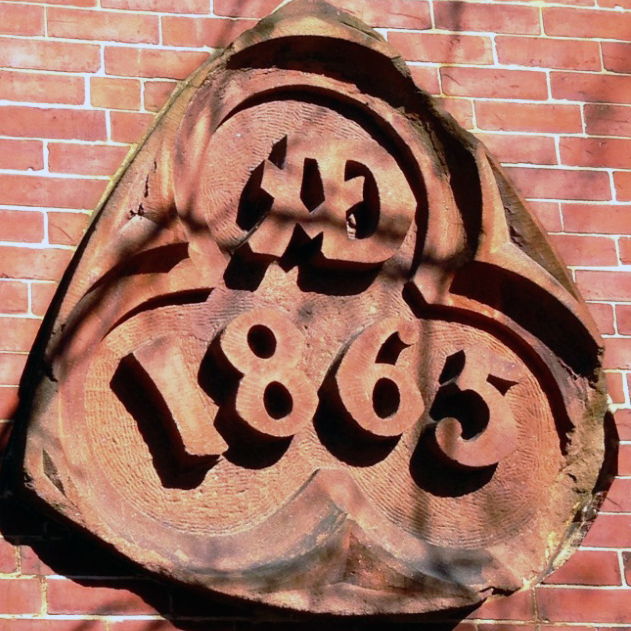 Its cornerstone was rescued and can be seen on the sidewall of 156 Warren Avenue, and now serves as the logo for the Friends of Hayes Park. The park was a welcome and much needed addition to the neighborhood, but over the next decade or so, the landfill from the old church settled so much that by the mid-1980s the park was in need of major reconstruction work. In 1987 a group of South End neighbors started the Friends of Hayes Park to work in partnership with the Boston Redevelopment Authority to update and redesign the park. The group secured major capital funds and worked closely with landscape architect Ann Johnson to devise a comprehensive park plan. The landscape design sought to provide interest and color throughout the seasons, while the park’s new layout ensured that people of all ages would find enjoyment there. In June 1992, Hayes Park was rededicated and the bronze sculpture “West Canton Street Child” by prize-winning sculptor and West Canton Street resident Kahlil Gibran (1922–2008) was installed in the circular center bed. The park’s overall plan has proven to be a marvelous success – attracting residents and visitors alike with its flowering pear trees and stately sycamores, the spectacular tulip display each spring, its summer roses, and benches in both sun and shade for respite from the clamor of the city. Every day finds toddlers and young children climbing the play structure and having fun in the sand. Every week, from spring through fall, finds neighbors caring for the plants and bushes in this urban oasis. In 1992, Hayes Park received three awards for outstanding design: The Boston Society of Landscape Architects presented Ann Johnson with a Merit Award for Park Design; the Massachusetts Horticultural Society awarded the park the Urban Landscape Award in recognition of outstanding achievement in landscape design in public places; and The Boston Preservation Alliance gave Hayes Park its Landscape Award for sensitive design in an historical landmark district.